High-Bandwidth Socket accommodates 0.65 mm pitch LGA ICs. Socket is designed for 0.5 mm pitch SOIC IC. QFN Socket accommodates 0.5 mm pitch devices. ZIF Sockets are suited for 1.0 mm pitch BGA. ZIF Socket is suited for 0.4 mm pitch BGA. 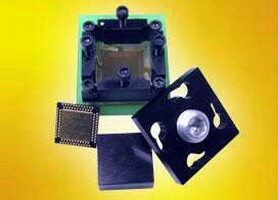 Socket accommodates 0.4 mm pitch BGA ICs. Socket is designed for 1.0 mm pitch BGA packages. Socket suits 1.0 mm pitch BGA chips. Sockets accommodate 84- and 92-pin BCC packages. Adapter allows probing of 48-pin QFNs.